Bright colors don’t always mean happiness. 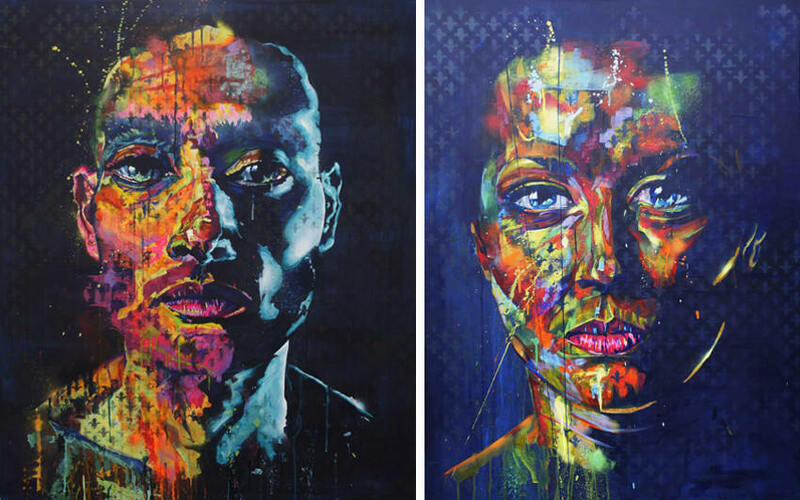 Instead, a deeper look into the faces painted by Rowan Newton reveals a whole array of emotions. It’s not that he deliberately confuses his viewers, it simply the influence of the street art he was exposed to from an early age. 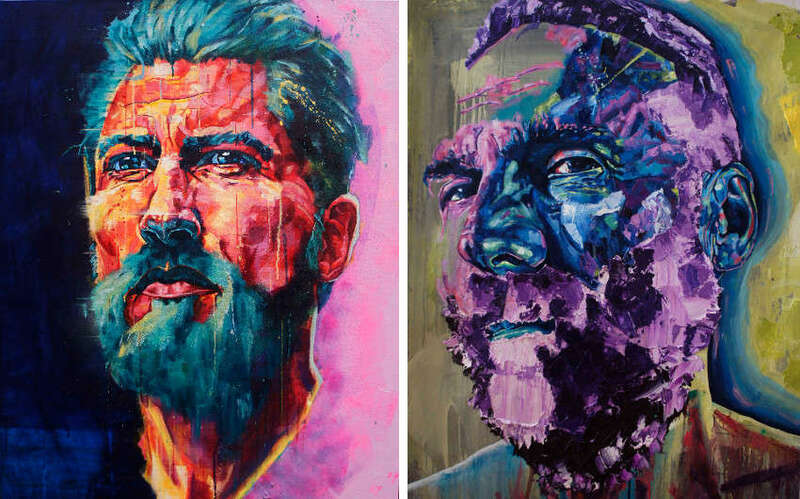 His paintings are full of character, provocative, and gritty. Everything starts from a sketch, so he draws thousands of pictures every week and chooses the best one for his paintings. Hip-hop, graffiti, and breakdancing have an influence on his art, and London as a whole is a never-ending source of inspiration. His style can be described as bright and colorful. People would expect to see happy emotions in the paintings, but instead, upon a closer look, there is really a lot that is going on. 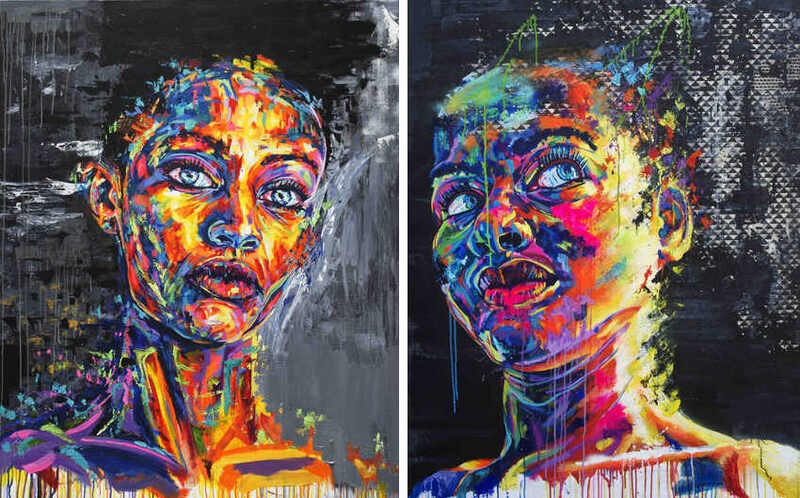 The faces usually have this intense look, and Newton’s style could be summarized as a juxtaposition of the bright colors and intense faces, often filled with sorrow. 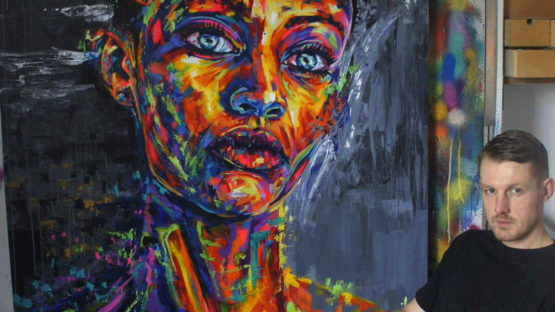 He mostly used acrylic paint, but from 2014 he’s been working exclusively with oil paint and spray paint. Newton is also inspired and admires the work of Jenny Saville, Egon Schiele, and Will Barras. The main goal is to be able to show the emotional aspects that people have in their lives. Newton grew up in Brixton during the 80’s and was surrounded by the graffiti, hip-hop, and break-dancing, which is evident in his work today. Also, his father would buy the Marvel comics for him, which he would then tirelessly copy. Today he has a daily routine he sticks to, with stuff on the plan aside from painting, like going to the gym, cooking, and answering emails. All those art unrelated things allow him to relax and think about things that are not painting. And even when he thinks about his work, it’s still different because it’s more about the ideas and freshness and less about how to paint something. On June 12th 2016, Newton will be releasing a new screen print with Jealous Gallery at the Art Car Boot Fair at Brick Lane Yard Car Park in London, alongside Peter Blake among others, so if you’re nearby, be sure to check it out. The world without art wouldn’t exist. All the things invented so far wouldn’t be if their creators hadn’t been creative, if they hadn’t been artists in a way. And for some people, art is the only way to fully express their emotions and communicate on the highest level with others. Rowan Newton is one of those people. Art is simply vital for him, both on a primal, but also on the higher, conscious level. When someone is that passionate about art, a success is guaranteed. He is represented by Pretty Portal in Düsseldorf. Rowan Newton lives and works in Greenwich, London.